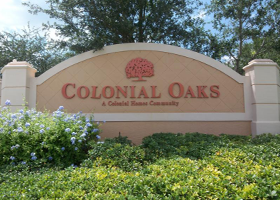 Colonial Oaks is a private, gated, community located just off Three Oaks Parkway in Estero, Florida. Two gates offer very convenient entrance into and out of Colonial Oaks Estero FL. This development offers the best in maintenance-free living, and has a few wonderful amenities: Colonial Oaks Estero FL has a children’s play area, pool, lake, basketball courts, and a clubhouse where you can spend time getting to know your new neighbors. Colonial Oaks Estero FL is conveniently located close to I-75, Coconut point mall, banking in Estero FL (Regions, Bank of America, 53 Bank), grocery stores in Estero FL(Publix, Target), and many choices in dining in Estero FL. With fewer than 100 single-family homes to choose from, Colonial Oaks Estero FL is peaceful and scenic. Colonial Oaks Estero FL offers different collections of home designs on beautiful lots. The Signature Collection offers 13, three- and four-bedroom floorplans with up to 3,200 sq. ft. One- and two-story designs are available. The Classic Collection offers 12, three- and four-bedroom designs with up to 3,577 sq. ft. Colonial Oaks Estero FL also prides itself on including several standard features usually considered upgrades in their new homes.